EFFECTIVE 3/1/19: All volunteers must be 18 years-old & be their own legal guardian to volunteer. For information on how individuals under 18 years-old can get involved, please message us for information. Much of the work necessary to keep the Shelter operating and the animals well cared for is done by dedicated volunteers. Please join the other wonderful compassionate animal-loving volunteers and help us care for our special animals. If you are interested in volunteering, please complete the online application or print, complete and return the application to the Shelter during adoption hours. All volunteers are interviewed after submitting their application and assigned to a specific volunteer opportunity and shift as available. If you love animals and would like hands-on time caring for them, this is the area for you! ALI prioritizes special-needs animals. Animals without owners who are sick, injured, pregnant, nursing, orphaned babies or handicapped. Description: Duties include, but are not limited to; cleaning, feeding, medical care, socializing, walking, bathing, and grooming. You can select dogs, cats or both. There is nothing as rewarding as seeing a dog or cat recover and find a forever loving home! Description: A lot of laundry and dishes are done to ensure the Shelter remains clean. Extra hands are always welcome! If you love animals and would like to help them with their social skills, this is the opportunity for you. Description: Duties include; walking, playing and brushing the dogs/puppies and playing and brushing the cats/kittens. Monday - Friday: 1:00 p.m. - 5:00 p.m. Description: Office help is needed for answering the phones to data entry. We have a high priority need for volunteers who can answer phones and complete general office duties Monday – Friday during the mornings (approximately 9:00 a.m. - 1:00 p.m.). Description: Volunteers are needed to assist customers, place new merchandise on sales’ floor, and cleaning. Shifts are available to meet each individual's availability. Description: Volunteers are needed to help at information and awareness events. Volunteer Hours: Informational/awareness opportunities are held on various days and time. Many are held in the evenings or during the weekend and last only a couple of hours. Opportunities include, but are not limited to Petco Adoption Events (monthly), Great Iowa Pet Expo, Dog/Cat Shows, Drake University’s Beautiful Bulldog Contest, and community parades. 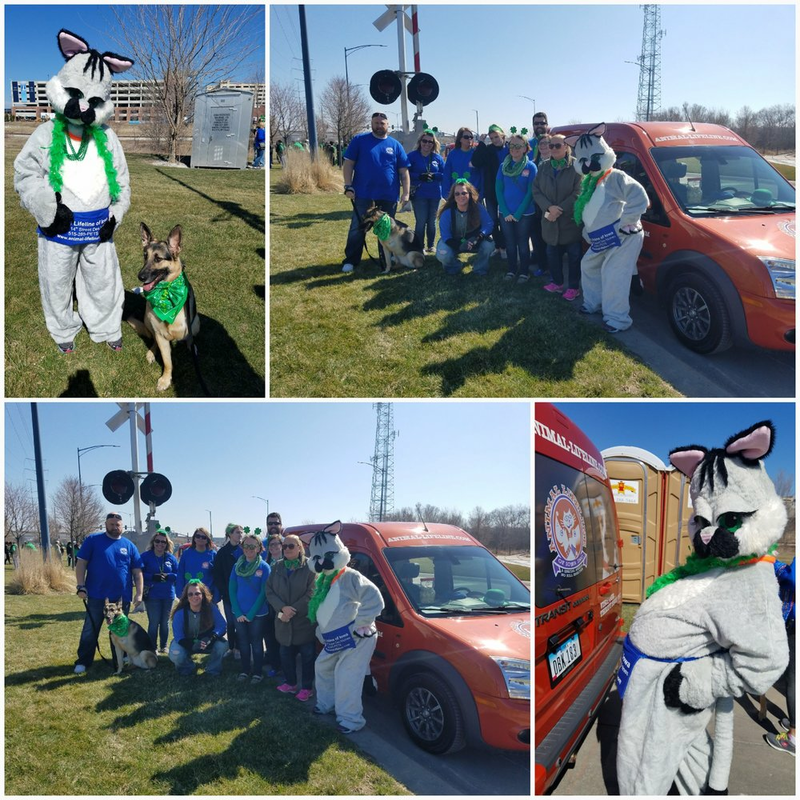 Description: Volunteers are needed to help with fundraising events such as serving on ALI’s annual Paws & Claws Benefit Auction (fall) committee, assisting with ALI’s Pints for Paws Pub Crawl & Scavenger Hunt (June), and ALI’s Dog Wash (July). Volunteer Hours: Most of the fundraising opportunities are held during the weekend. This is a great opportunity for someone to help the animals but can't get to the shelter! Description: ALI needs volunteers that can bake and donate ALI dog biscuits to be sold at ALI fundraisers & information booths throughout the year. We also need volunteers who can bake and donate tasty treats for humans (cookies, cakes, cupcakes, pies, bars, candy, snack mix, etc…) for the Bake Sales at the ALI Thrift Shop we host throughout the year. Location: This project can be done from your home. Roll out dough to 1/4" thickness. Cut with dog bone cutter (or cut into 1 x 2in. strips) and place on foil-lined cookie sheets. Use scraps to make new ball; roll and cut as above. Bake 40 minutes. Cool on a wire rack at least 24 hours. Biscuits must be completely dry before packaging. Description: We are in need of volunteers that have graphic design and/or publication design background. Location: Majority of the work could be done from your home or office. Animal Lifeline of Iowa (ALI) is Central Iowa’s only special needs, no-kill animal shelter, celebrating 30 years of serving the Des Moines area and all of Iowa. We rescue cats and dogs that are injured, handicapped, have a serious medical condition, abused, pregnant and nursing moms, or orphans that require bottle feeding. We rehabilitate the animals, who run a higher risk of euthanasia in a traditional shelter setting, and then adopt them into loving forever homes. Animal are not euthanized because they have been at the shelter for a certain length of time. Monday - Saturday: 1:00 - 5:00 p.m.